Hackers like to hack. This is not a bad thing. In fact, “hack” originally did not mean “break into goverment/financial systems and do bad things”, and a “hacker” was not an unsavoury individual who did the aforementioned “bad things”. A “hack” originally meant “an elegant and clever solution to a problem” (although, it paradoxically also means “crude and ugly solution to a problem”), and a “hacker” is a person who comes up with such solutions. Most programmers call themselves “hackers”. The media term “hacker” is actually described by the term “cracker”. Hackers are constantly tinkering with things. Usually they are trying to make things better, but more often than not, they end up breaking it. However, in the process they learn very valuable lessons about how not to break something, and then immediately find another way to break it again. In all seriousness though, what we learn are the limits of the system, and how the system works. Hackers don’t like unknowns and black boxes. They want to know what makes things tick. My dad got me my first computer in 1990. I didn’t do much on it at first other than play games. I actually started writing code in 1992, and I haven’t stopped. I’ve been hacking around since then, and in the process I’ve learnt a lot of many cool things. Over the years I’ve experimented with various OSes and programming langauges, and in the process broken and hosed many computers. But each time I learnt something valuable from them… mostly. One of the cooler things (I didn’t learn anything from this really, it was just a bug) I did was writing a self-replicating Perl script that kinda ran wild on ASU’s Solaris server. There were so many scripts running around that it brought the server to a crawl. I eventually figured out what was happening and managed to kill all the processes. Anyway, my point is that people like me like to tinker around. We don’t mind if we break stuff while doing it, because we’ll figure out a way to fix it. It’s the “figuring out” part that makes us happy. So what does all of this have to do with Apple, Hipsters, and Hackers? Well, in Neal Stephenson’s book he describes two kinds of people: Eloi and Morlocks. An Eloi is your average internet user; they view computers as appliances and tools and nothing more. A Morlock, on the other hand, is your average hacker. The computer is definitely a tool, but it is a tool that can be used to create other tools. The workings of a computer are usually a mystery to an Eloi, but not so for the Morlock. Before Mac OS X, most users of Macs were of the Eloi variety. The Mac was a beautiful and stylish magic-box that did wonderful things. The inner workings were a mystery. You couldn’t easily get inside and tinker with it, but that wasn’t really an issue because Eloi don’t care about things like that. Morlocks gravitated more towards the PC world. Sure, PC’s were clunky and definitely not as stylish as a Mac. Plus, a lot of them ran Windows which many Mac fans claimed was a clunky and cheap copy of the Mac OS (in truth, everyone basically copied Xerox PARC). However, they could be opened up and tinkered with. At this point in time, there was also this thing called Linux, which was an interesting piece of software (at the time). Linux is basically just an operating system. What most people mean when they say they “run Linux”, is that they run a distribution of Linux. A distribution consists of the kernel (Linux), in addition to a bunch of userland tools (programs that actually let you do something). The cool thing about Linux was that it was free. You could go download it and install it on your computer and it would run. What was even more interesting was that it was made by volunteers. People actually took the time to sit down and write code to improve and enhance the operating system. Running Linux in those days was a chore. Most distributions came with a GUI (X with a window manager), but sometimes things didn’t work quite right if you had an obscure monitor and video card. Getting things to work meant going to the command-line and writing strange, arcane incantations and if the Gods were pleased, your hardware might work. But that didn’t bother the hackers, because it was fun trying to get things to work. In addition there was also a certain elitism about it. Running a Linux box meant that you had the time, patience, and above all, intelligence required to go through the mental contortions required to get a working system. But intellectual elitism is nothing new for hackers since all hackers have a bit (ok, a lot) of hubris. Ok, so where am I going with this again? Seriously, I have a point. Things changed when Mac OS X came out; it had a command line. The command line is very important to us hackers because it lets us look “under the hood” of the GUI. True hackers always go to the command line to do serious work. The command line is a place where a pithy one-liner can replace a series of windows and buttons. To the uninitiated, the command line is a scary place where confusing and dangerous things happen. Just like a magic spell, you had to write obscure words and symbols to the computer, in the correct sequence. If you were lucky, the computer would derisively spit out an error. If you weren’t you probably broke your computer. If you were really lucky, the computer accepted your commands and did what you told it to do. The point of the commandline is that you get God-like power (mostly; to truly be God you had to be root). While this power enables you to be extremely efficient, it also enables you to do destructive things equally efficiently. The GUI shields you from the hard edges of the underlying OS. The cryptic command line is replaced by friendly windows and buttons. When the Mac OS got a commandline in Mac OS X, hacker types were suddenly interested in it. You now got the legendary stability and the “it just works” attributes of a Mac OS with the power of a commandline, and that too, a UNIX commandline (OS X’s kernel is essentially based on BSD, which is a direct descendant of the original UNIX). Which brings me to the main point. What I’ve noticed over the last few years, especially after graduating from college, is that even though I love to hack around and test the limits of a system, most times I simply want a system to work. I want to spend less time fixing the system, and more time fixing my own code. I have also noticed that I’m not the only one with these sentiments. Many of my fellow nerd and hacker friends own Macs and develop on them now. I considered getting a Mac as well, but it was a little over budget for me and I couldn’t justify the cost at the time. Macs provide a very good mix of power and stability, and that is extremely attractive to a developer. You can still hack around on the Mac (and you could probably break it), but most of the time you know it’s something you did that broke the system, than just a quirk with the system. In my personal opinion, I think Apple’s decision to include the command line in OS X was brilliant (their other good move was moving over to the ubiquitous x86 architecture). 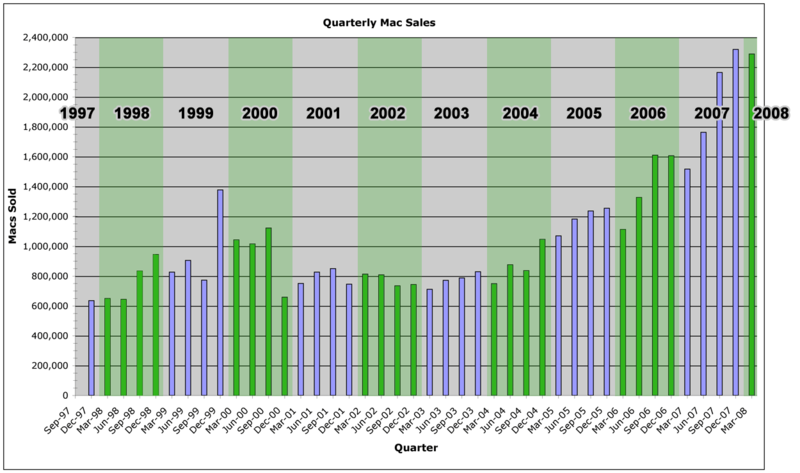 In fact, if you look over the sales chart (courtesy systemshootouts.org) of the Mac from 1997 to 2008, you can see how their sales remained more or less constant from ’97 to ’02, after which it really started taking off. OS X was released in 2001. In the old days, Mac users were a tight-knit, elitist bunch who sneered at their less-fortunate Windows-using cousins. Most times, it was with good reason. The Mac OS was stable and polished, while Windows was a clunky GUI bolted on top of a command line. To be fair to Microsoft though, Apple didn’t have to put up with exotic hardware since they had complete control over it. The demographic that Macs attracted was mostly the artistic or hipster bunch. In recent years, the demographic has increased to include some people who also liked the supposed “coolness” of the Mac. If you owned a Mac, you were different. You were part of a “cool”, “hip”, and “artistic” minority. Apple played this up, marketing the Mac as not only a stable alternative to a PC, but a cooler alternative too. Today you have more people than ever using Macs. From a sorority chick who uses it because “OMG it’s like so pretty!” to a programmer who likes it because “OMG d00d it’s lyk teh UNIX! !11!” Apple has successfully bridged the gap between two extremes. In future years, I think Apple will continue to grow stronger, and the sales of Macs will continue to rise, providing a viable, proprietary alternative to Windows. I’m not an Apple fanboi; I like FreeBSD (perhaps why I have a soft spot for OS X) and Linux more, but I think Apple deserves respect for making an excellent OS that’s friendly to hackers and hipsters alike. Happy New Year, everyone! Hope this year is better than the last. I’m in Irvine right now, with family. I won’t be back in AZ until the 4th. Looking forward to relaxing for a couple of days.